Mg/bioceramic composites fabricated by powder metallurgy technique have been explored for biodegradable load-bearing implants. Although sintering behavior including densification and reaction has a significant effect on mechanical properties of the composites, little studies have been conducted focusing on both sintering behavior and mechanical properties. In this study, Mg/10 and 20 vol.% β-tricalcium phosphate (β-TCP) composites were fabricated by spark plasma sintering, which achieved high densification. Distinct sintering behavior of Mg/β-TCP composites involving reaction was investigated by estimating relative densities during sintering, thermal analyses, X-ray diffractometry and auger electron spectroscopy. 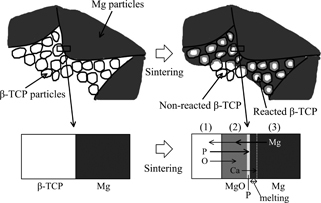 The results suggest that Ca solid diffusion into Mg during sintering resulted in melting and penetrating Mg into gaps between β-TCP particles, and finally led to high densification. The reaction between Mg and β-TCP produced MgO. Compression tests showed that Mg/β-TCP composites enhanced their mechanical properties compared with Mg sintered at the same route. That&apos;s because the high densification of Mg/β-TCP composites and high hardness of MgO potentially caused good load transfer from Mg-matrix to the formed MgO as reinforcement. The discoveries regarding the reactions can help the design of Mg/calcium phosphate composites including Mg/β-TCP composites.